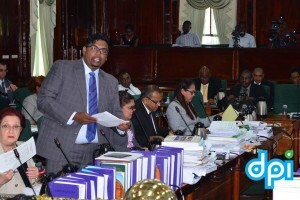 People’s Progressive Party (PPP) front-bencher, Irfan Ali and Minister of Natural Resources, Raphael Trotman Wednesday night clashed over ministerial oversight and disposal of the Reserve Fund. Ahead of the sending of the Petroleum Commission Bill to a bipartisan parliamentary select committee, Trotman, in kicking off debate on the draft law, rejected the PPP’s claim at a public meeting at Enmore, East Coast Demerara that the fund would be used as a “slush” fund. He said the Reserve Fund is nothing new because every statutory agency such as the Guyana Geology and Mines Commission has one and it is only the Finance Minister who directs from time to time that there should transfers to the Consolidated Fund. 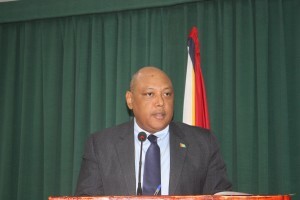 Trotman later explained, in wrapping up the debate, that the semi-autonomous regulatory Petroleum Commission would only collect fees and penalties, but royalties would be administered by the Finance Ministry. However, that explanation did not go down well with Ali, who noted that the Petroleum Commission empowers the minister to invest in securities generally and specifically and that the minister may sell all or part of the securities. Ali, a former Finance Ministry official, further argued that the Bill violates the Fiscal Management and Accountability Act because the minister would be able to transfer all the net revenue to the Consolidated Fund. “It is not subject to the whims and fancies of any minister,” he said. The PPP shadow finance minister also flayed the Bill for empowering the minister to appoint an auditor of the accounts and have the auditor report to him. The Minister of Natural Resources said the Bill would be taken to a Select Committee for further consideration although it has been considered by several experts and law firms. “Still we believe that it will serve better if it goes to a committee and it has the benefit of a bipartisan look at it,” he told the House. Ali assured that the PPP has taken with “sincerity that you will approach this matter in a bipartisan manner” and that the Committee will allow for interested stakeholders to have an opportunity to make contributions. The PPP parliamentarian raised several concerns about the powers of the minister, but Trotman before noted that under Guyana’s constitution executive authority resides in the President who then delegates responsibilities. The Bill provides for the mandatory appointment of a representative of the political opposition and civil society to be appointed to the Board of the Petroleum Commission. The Commission will take over all hydrocarbon responsibilities, data and material from the GGMC now that oil has been found in Guyana in commercial quantities. First oil is expected to be pumped by ExxonMobil in 2020 from the Liza well located more than 120 miles offshore Guyana.